Home / Auto Mechanic / What Does a Mechanic Do? The set of skills employed by an honest auto mechanic is one of the valuable commodities of the U.S. economy that will always reign in high demand. Like electrical engineers, computer technicians, farmers and construction workers, society will always have a place — and an undeniable respect — for the men and women who can make an automobile, well, auto-mobile again. Whether you’re a client or an aspiring mechanic yourself, the all-important question — “What does a mechanic do?” — is a good question with even better answers. This includes listening to client complaints, making suggestions and providing relevant advice as needed. It’s the mechanic’s job to ask questions that narrow down the possible issues and suggest the suspect causes thereof. By working together with the client, a productive bond is forged toward the correction of the vehicle’s maladies. Recommendations are also expected of a mechanic, as the client may not know anything about automobiles. Clients may also feel that something is wrong with the vehicle when in fact it’s working as intended. Take the cruise control in Honda Civics for example Some customers complain that it deviates from the set value by 2-3 mph, but this is normal because the transmission uses a belt design that sacrifices cruise precision for durability. These are the kinds of explanations that customers like to hear instead of “you’re doing it wrong”. Just like with any other shop, someone has to take inventory, place orders and stock the incoming resources in their correct locations. It’s also the duty of a mechanic to keep certain materials prepared for fellow mechanics who are anticipating the requirement of a specific service. If a mechanic notices that a tool needs replacing or a particular resource (bolts, filters or tires, for example) is running low, it’s their responsibility to inform the necessary teammates to stay on top of it. 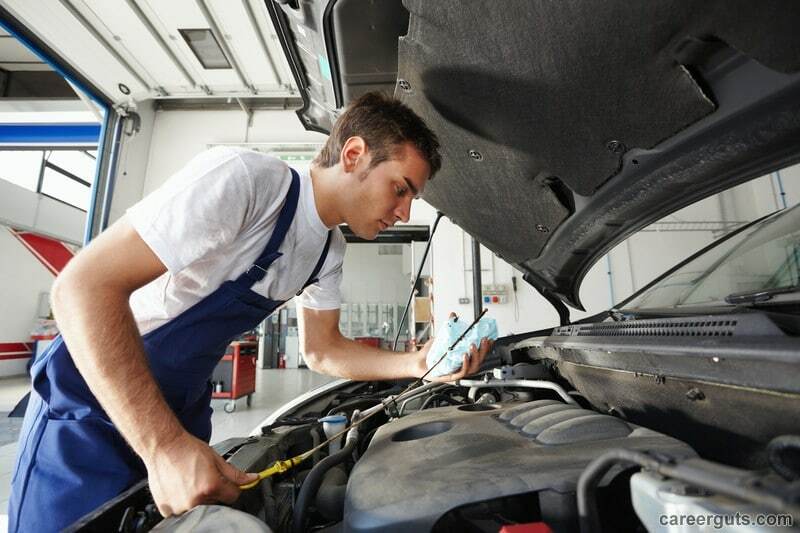 It’s a role of an auto mechanic to keep track of service operations, evaluate interactions between vehicle damages and warranty coverage, and make judgment calls on when certain parts or fluids need repair or replacement. They’re expected to use a diagnosing tool to generate problem codes and determine what specific part would best suit the vehicle in question. Circumvention and general problem-solving also come to mind, as the best solution isn’t always the most direct one. Mechanics will also have to decide if it’s in the customer’s best interest to settle for a used component or stick to a new replacement, as wait times and cost differences can throw a spanner in the works, so to speak. Of course, the this-or-that proposition should always be brought up to the customer before a final decision is made — that’s a legal requirement. Going forward, there are quick-pacing advancements to computer technology that are inevitably bleeding over into the auto industry with each passing year and with increasing rapidity. Today’s cars have everything from Bluetooth to inbuilt GPS, high-definition screens, back-up cameras, digital displays, sensors of every type and computerized exchanges that ramp up the complexity of your roadside machinery. What does this mean for aspiring auto technicians in this day and age? It means that the line dividing computer and automotive technology is fading. The same could be said for the lines between, say, computer and medical industries, or computer and appliance construction — the point is, everything is digitizing, and we’ve seen nowhere near the end of it. With that in mind, mechanics have to learn not only how the actual machinery in an automobile works, but also how the integrated computers tie into that. 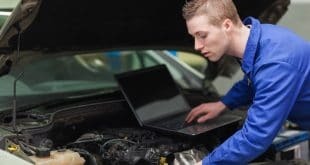 And, well, with the pace of computer technology, that means that every forward-thinking auto technician needs to plan on today’s technology being obsolete tomorrow. The bottom line is, aspiring auto technicians will need to constantly keep themselves updated on what’s being implemented in clients’ vehicles, how it works, what it does and how to fix it. They’ll be expected to quote price points, know how to take a particular apparatus apart and put it back together, what that satellite receiver does, or how the pedestrian auto-brake systems work — it’s becoming more challenging to keep up with what each car provides and how to deal with it. This, too, is a role of today’s auto mechanic. Previous What Is an Auto Mechanic?